ISRAELIS THAT MASS MURDER CHILDREN THREATEN TO MURDER JOURNALIST FOR CARTOON IN HAARETZ THAT SHOWS THAT ISRAEL MURDERS JOURNALISTS! | Concise Politics -- Your Time should NOT be wasted. ISRAELIS THAT MASS MURDER CHILDREN THREATEN TO MURDER JOURNALIST FOR CARTOON IN HAARETZ THAT SHOWS THAT ISRAEL MURDERS JOURNALISTS! Haaretz published a cartoon compared 17 journalists killed in Gaza by Israelis during the brutal summer 2104 slaughter with the journalists killed at satirical magazine in Paris. 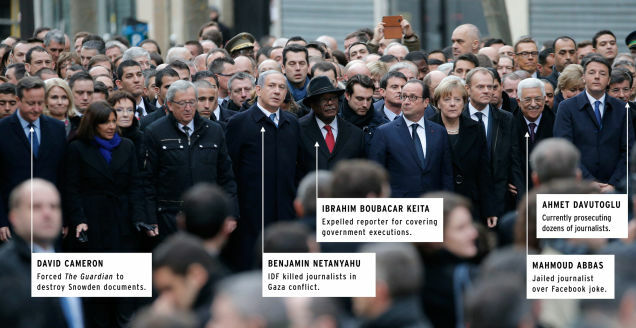 Israelis called for murdering Haaretz journalists. Shoval = His NAZI movement are no strangers to controversial cartoons = Smear campaign against New Israel Fund’s, Naomi Chazan = Depicting her wearing a horn as the devil being stabbed by Herzl himself = Blamed Chazen and NIF for the INCRIMINATING Goldstone report that caused the “deligitimization” of Israel. This entry was posted in ISRAELIS THAT MASS MURDER CHILDREN THREATEN TO MURDER JOURNALIST FOR CARTOON IN HAARETZ THAT SHOWS THAT ISRAEL MURDERS JOURNALISTS! and tagged ISRAELIS THAT MASS MURDER CHILDREN THREATEN TO MURDER JOURNALIST FOR CARTOON IN HAARETZ THAT SHOWS THAT ISRAEL MURDERS JOURNALISTS!. Bookmark the permalink.